A Prunus domestica L. cultivar. ‘Branches downy. Fruit below the middle size, oval, about one inch and a quarter deep, and an inch in diameter. Stalk half an inch long. Skin deep purple, covered with a thick blue bloom. Flesh brownish yellow, with a few red streaks near the stone, from which it separates. Juice sweet, with an agreeable flavour. Ripe on a south wall the end of July.’ [George Lindley – Orchard Guide p.444/1831]. ‘Duhamel described this variety, Gros Damas de Tours and Gros Noire Hative in the same publication, his descriptions of the three varieties being nearly identical. Following Duhamel many horticultural authorities continued to separate the varieties, but Downing, Floy-Lindley and Mathieu give Damas de Tours as a synonym of Early Tours, and Thompson, Hogg, Downing, Mathieu and the Guide Pratique give Noire Hative as a synonym, while Prince holds Prune Noire Hative to be synonymous. With this great similarity in the names and descriptions, it seems doubtful if these are separate varieties, but not having the fruit of the three to compare it has been thought best in The Plums of New York to follow the nomenclature of the oldest authorities. 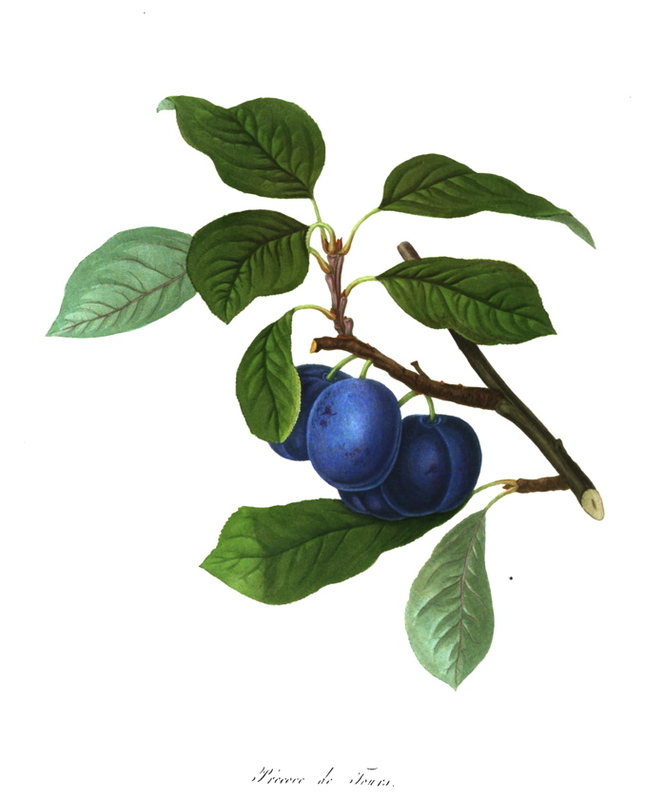 Several writers have also named the Blue Perdrigon and the Perdrigon Violet as identical with Early Tours but neither can be, as all descriptions indicate that both are at least a month later in ripening than the variety under discussion.’ [Plums of New York p.202]. Described and figured in Pomona Londinensis [PL pl.34/1818], the figure used here. Pomona Brittanica figures the Purple Hative plum which is probably synonymous [PB pl.XV/1812.]. Listed in Addenda to the 1857 catalogue as ‘Violette Hative’ [Plum no.16/1857].